We want your opinion! Let us know how we are doing and what we can do to improve by taking our short survey here. The Younger Member Group kicked off their first in person board meeting earlier this month. Planning has begun for another busy year of volunteer activities, outreach, and social events. Be sure to check our calendar of upcoming events and board meetings to get involved. All are welcome to attend, and we would love to have your input. Hope to see you in the future! Rhode Island ASCE members and their families joined the ASCE Younger Member Group in sponsoring the 2018 Annual Rhode Island Infrastructure Design Professionals Summer Outing at the Pawtucket Red Sox on August 16, 2018. The fun, family-friendly event was held on the Pre-Game Party Terrace which provided awesome views from left field and plenty of good food. The PawSox defeated Bulls with a final score of 8 to 2! Thank you to our sponsors for helping to make this another great year! Nat Tobey, RI ASCE YMG President, and Katie Scancarello, RI ASCE YMG Treasurer, joined over 400 ASCE leaders on February 9 and 10, at the 2018 Multi-Region Leadership Conference (MRLC) and Eastern Region Younger Member Council (ERYMC) in Buffalo, NY. Over the course of the two-day conference, participants connected with ASCE President Kristina Swallow, President-Elect Robin Kemper, Region 1 Governor Danielle Spicer, YMG and student chapter members, mentors, and Section leaders from ASCE’s Eastern Region (Regions 1, 2, 4, and 5). At the ERYMC Business Meeting, Katie and Nat engaged in thoughtful and enthusiastic discussions with fellow younger members on subjects including Raising the Bar, diversity initiatives, ASCE Code of Ethics, and the role of younger members on the ASCE Board of Direction. Highlights of the conference included breakout workshops with fellow YMG leaders, Q and A with ASCE Presidential Officers and Directors, Pre-College Outreach Workshop, and curling at Canalside Buffalo. Thank you to the Buffalo Section for being such a great host! Rhode Island Society of Environmental Professionals Scholarship Opportunity! The Rhode Island Society of Environmental Professionals is now accepting applications for the 2018 College Scholarship. Three scholarships in the amount of $1,000 will be awarded to a qualified student to use during the 2018-2019 academic year! Click here to obtain the Rhode Island Society of Environmental Professionals Scholarship Application Form and please encourage any eligible students that you may know to apply! Applications are due on May 31, 2018. The Rhode Island Marine Toys for Tots Foundation received several new toys this December when the RI ASCE Younger Member Group and Providence Engineering Society came together to spread holiday cheer and collect toys. 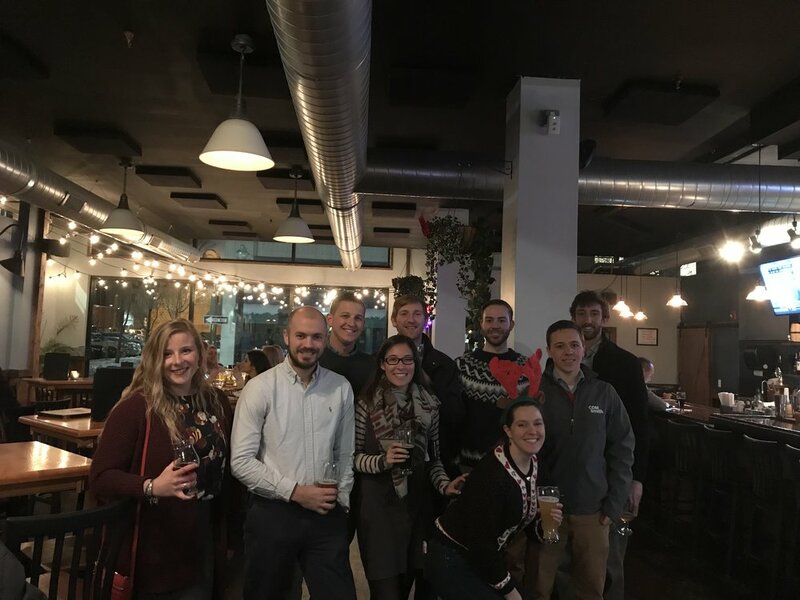 The annual joint Toys for Tots holiday social was held on the evening of December 14, at the Malted Barley in Providence, RI. Members of ASCE and PES, along with their families and friends, turned out in multitudes to donate toys and enjoy the company of fellow engineers and local professionals. Individuals who donated a toy received a complimentary beverage, and everyone enjoyed a sampling of the Malted Barley’s delicious pretzels. The mood was very festive as members from each organization made new acquaintances and caught up with friends. Additional thanks go to the AECOM Providence Office for adding the toys that their staff donated to our drop off on Friday! Providence Engineering Society Scholarship Opportunity! The Providence Engineering Society is now accepting applications for the 2018 College Scholarship. At least one scholarship in the amount of $2,000 will be awarded to a qualified student to use during the 2018-2019 academic year! Click here to obtain the P.E.S. Scholarship Application Form and please encourage any eligible students that you may know to apply! Applications are due on December 29, 2017. On August 4-6, 2017, the ASCE Committee on Younger Members hosted the annual Younger Member Leadership Symposium (YMLS) at ASCE Headquarters in Reston, Virginia. The conference brought together 49 Younger Members from across the country to network, discuss pressing issues facing the civil engineering profession, and develop a variety of soft skills necessary for effective leadership. The symposium hit the ground running with the start of the pre-conference activities at 8 AM on Friday morning. The energized group of engineers headed into Washington, D.C. for a day full of adventure. After sharing a few fun facts about one another on the bus, they toured the newly restored U.S. Capitol Building. Click the link below to see the innovative technology being used by Brown University and Odeh Engineers. This June marked the start of a new year for the Rhode Island Section YMG. We have continued to conduct conference calls for our monthly meetings over the summer. This can be a busy time of the year for everyone and it great to see such strong participation from current and new members. On August 24, 2017, we are hosting our 12th Annual Rhode Island Infrastructure Design Professionals Night at McCoy Stadium. We have been very fortunate to receive the continued support and sponsorship of local engineering firms and partner organizations. They have helped us make ticket prices more affordable for all and for the first time in our 12 years of running this event, children's tickets will be free. In 2017 - 2018, we will be working on new and exciting activities that will gain more interest. Additionally, we will continue with social events such as the Providence Bruins hockey games, a YMG meet and greet, and much more.